SPIDERS on marijuana are so laid back, they weave just so much of their webs and then ... well, it just doesn't seem to matter any more. On the soporific drug chloral hydrate, they drop off before they even get started. A spider's skill at spinning its web is so obviously affected by the ups and downs of different drugs that scientists at NASA's Marshall Space Flight Center in Alabama think spiders could replace other animals in testing the toxicity of chemicals. Author(s): Noever, David A.; Cronise, Raymond J.; Relwani, Rachna A.
Abstract: Method of determining toxicities of chemicals involves recording and analysis of spider-web patterns. Based on observation spiders exposed to various chemicals spin webs that differ, in various ways, from normal webs. Potential alternative to toxicity testing on higher animals. 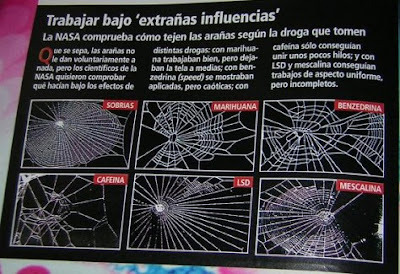 LSD and THC affect higher brain functions in the neocortex, an area of the brain which spiders lack. It is highly unlikely that they would react to drugs in the same way people would. And it is more than likely another hoax "informing us of the Dangers of Marijuana. te interesa intercambiar enlaces conmigo? El Blog lo tengo un poco abandonado, la verdad (donde vivo ahora lo único que se puede fumar es una cosa negruzca que huele a mezcla de pis de gato y neumático quemado, puaaajjjj), pero vale mándame el banner y te lo pongo. Mi dirección en mi perfil. Si quieres también te invito al Blog, te das a conocer y escribes algo. 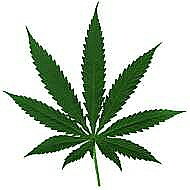 Cultivation of any amount of marijuana is a felony under Health and Safety Code 11358. People who grow for personal use are eligible for diversion under Penal Code 1000 so long as there is no evidence of intent to sell. There are no fixed plant number limits to personal use cultivation..